April 29th 1964: Delivered to Otto Thoresen Shipping Co A/S, Oslo, Norway. May 4th 1964: Introduced between Southampton – Cherbourg , being registered as CARFERRY VIKING I.
September 7th 1964: Slightly damaged in Outer Dock, Southampton when in collision with British Railways cargo vessel ELK. 1965 (Winter): Chartered to Atlantic Steam Nav. Co., London. Introduced between Tilbury/ Felixstowe – Rotterdam – Antwerp. 1965 (Summer): Operated between Southampton – Cherbourg. January 1966 – March 1966: Chartered to Atlantic Steam Navigation for service between Tilbury (London)- Antwerp. March 1966: Back operating between Southampton – Cherbourg. December 21st 1966 – February 18th 1967: Chartered to Atlantic Steam Navigation for the Antwerp – Rotterdam route then switched to the Irish Sea and operated seventeen sailings between Preston and Belfast/Larne. She then went to Oslo for the fitting of additional cabin accommodation behind the bridge. 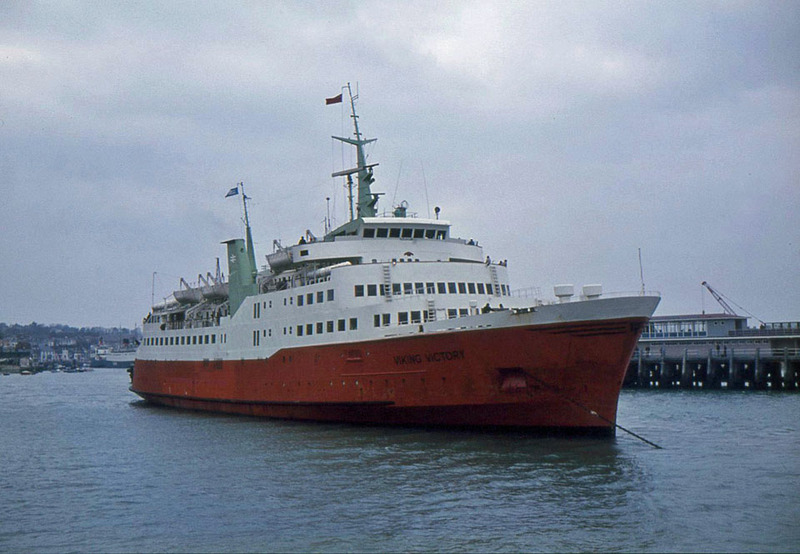 March 1967: Back in service between Southampton – Cherbourg. 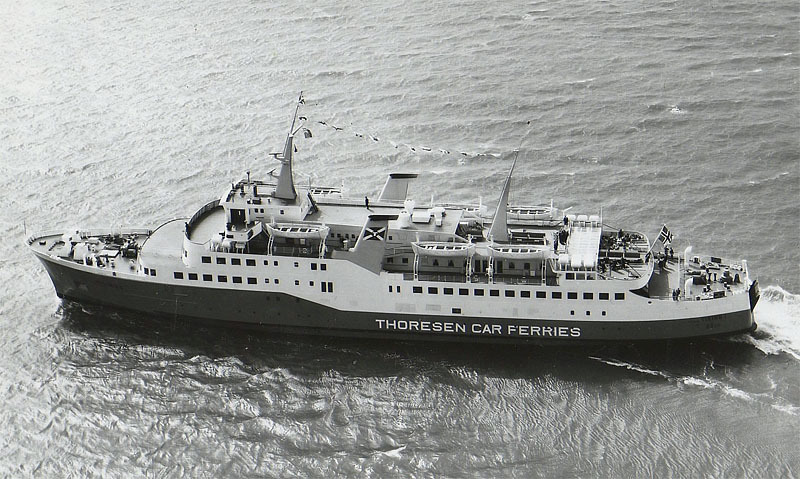 September 12th 1968: Registered to Thoresen Car Ferries A/S, Oslo and chartered for 20 years to Thoresen Car Ferries Ltd., Southampton. 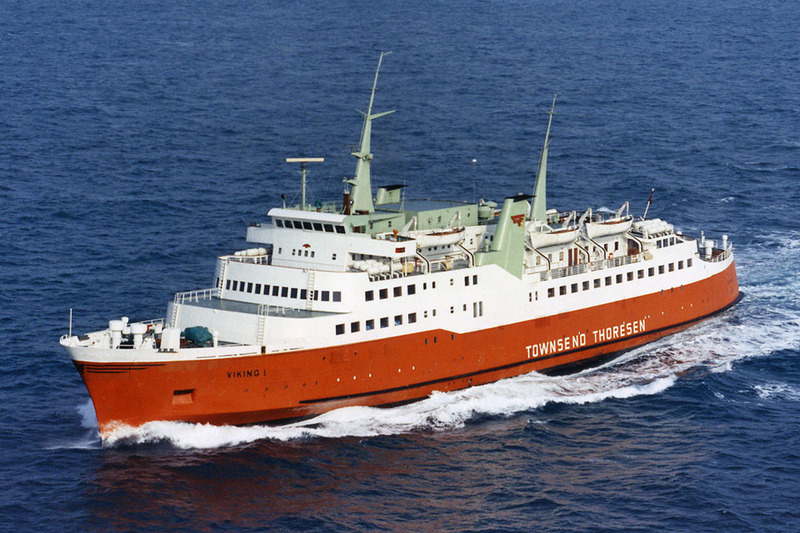 Merger of Otto Thoresen Shipping Co, A/S, Oslo and Townsend Car Ferries, Dover. Joint companies named changed to Townsend Thoresen Car Ferries. October 11th 1969: Chartered to Oy Siljarederiet AB, Åbo, Finland. Left Southampton for Åbo via Lübeck. 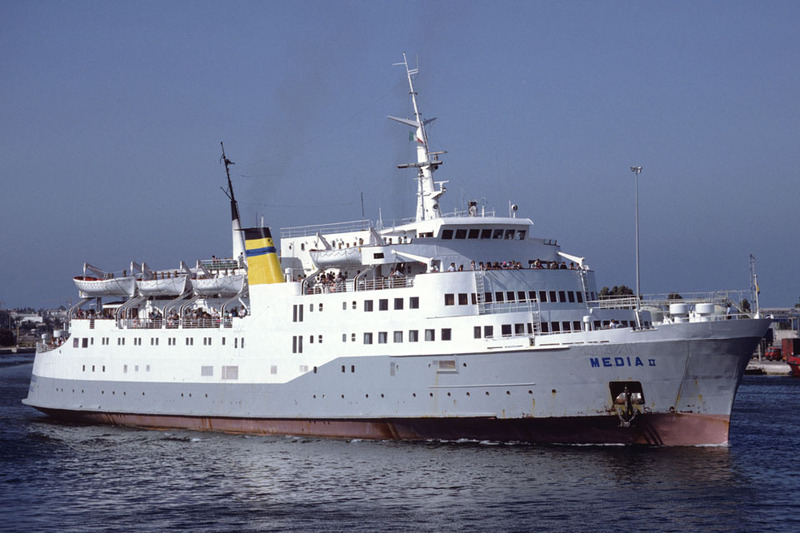 October 15th 1969 – December 25th 1969: Operated between Stockholm – Mariehamn – Åbo. November 1st 1969: Damaged in severe storms and repaired at Finnboda Yard. November 11th 1969: Resumed in service. December 25th 1969: Left Stockholm for Dover. December 28th 1969: Commenced service between Dover – Zeebrügge. February 4th 1970 – February 27th 1970: Laid up in Southampton. February 1970 – April 1970: Major refit at builders yard in Bergen, Norway. April 1970 – October 15th 1970: Operated between Southampton – Le Havre/ Cherbourg. October 16th 1970: Left Southampton for Gothenburg. October 18th 1970 – November 27th 1970: Major refit at builders yard in Gothenburg. November 29th 1970: Introduced between Southampton – Le Havre/ Cherbourg. October 1st 1973: Chartered to Travemünde-Trelleborg Linien GmbH & Co. KG, Hamburg, Germany. Left Southampton for Travemünde. 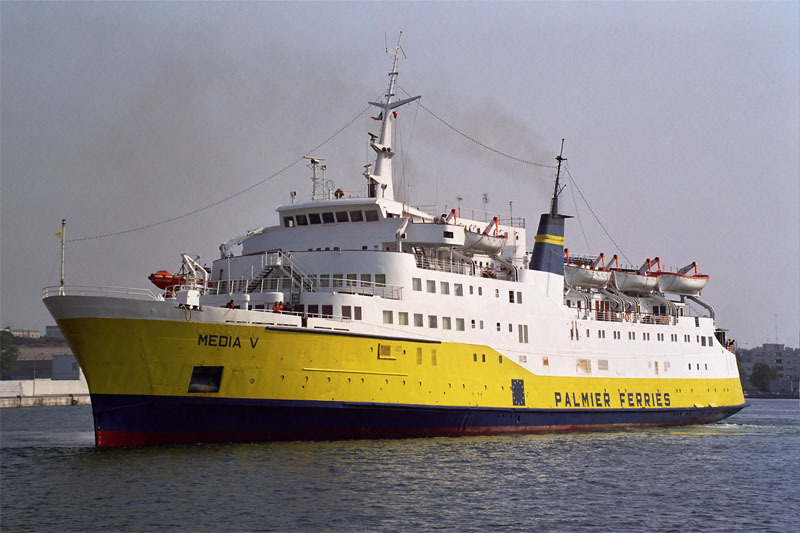 October 6th 1973 – March 1974: Operated between Trelleborg – Travemünde. 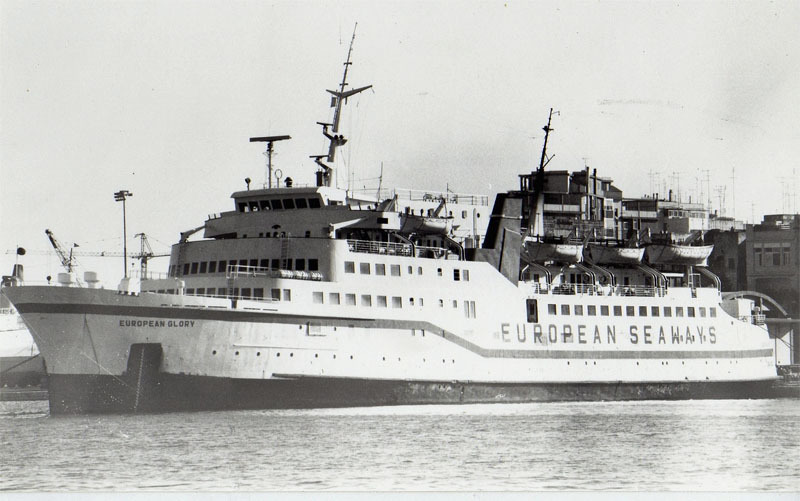 March 1974: Commenced service between Southampton – Le Havre/ Cherbourg. 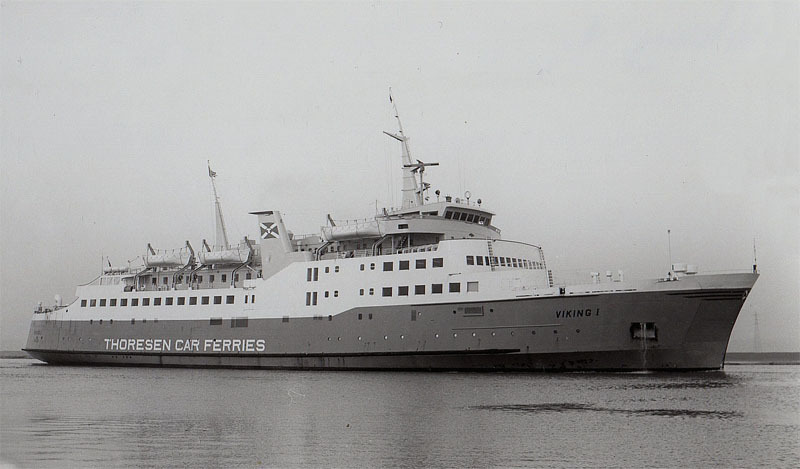 February 1975: Chartered for a month to Lion Ferry Ab, Halmstad, for use with Prinzen Line services between Hamburg – Harwich. April 11th 1975 – May 21st 1975: Operated between Felixstowe – Zeebrügge. June 17th 1976: Renamed VIKING VICTORY. Introduced between Portsmouth – Le Havre/ Cherbourg. 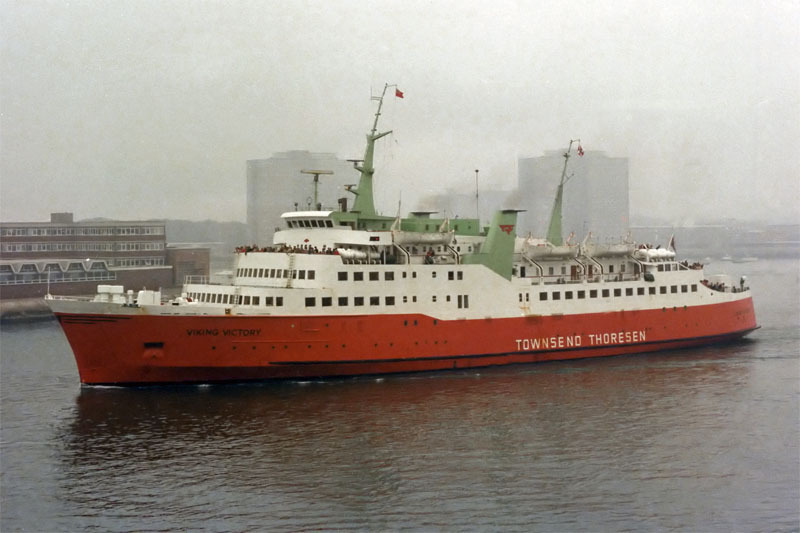 September 1976 – December 1976: Chartered to Stena Line Ab, Göteborg. Operated between Gothenburg – Frederikshavn. December 1977: Laid up in England. 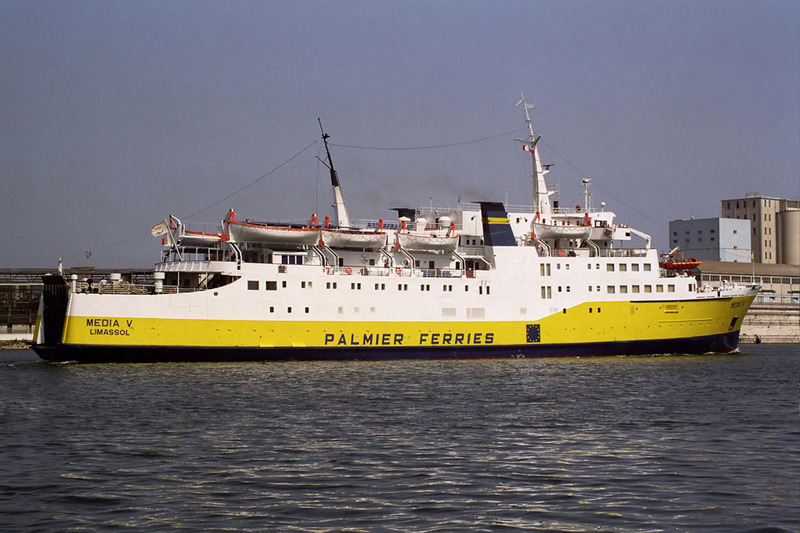 June 1977 – September 1977: Operated between Portsmouth – Cherbourg. September 1977: Laid up as an accommodation ship in Southampton. 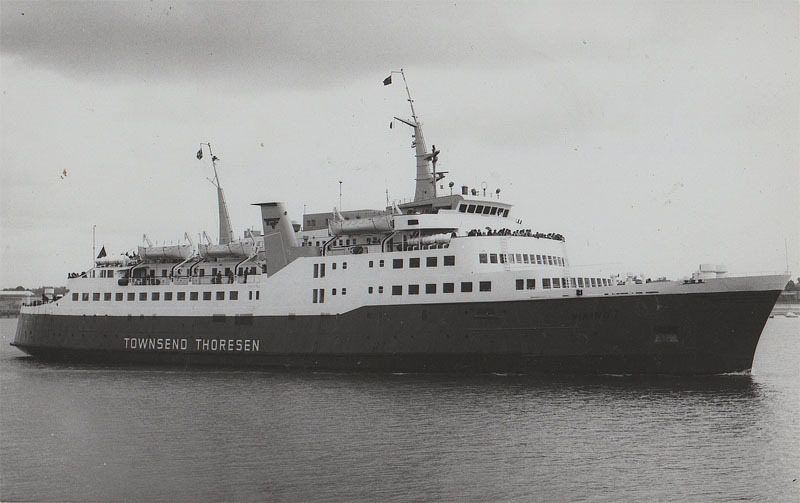 October 1st 1977 – November 23rd 1977: Chartered to Travemünde-Gedser Ruten A/S, Gedser, Denmark. Operated between Gedser – Travemünde. April 1st 1978 – April 28th 1978: Chartered to Sealink U.K. Ltd. Operated between Weymouth – Guernsey – Jersey, as cover for the strike-bound EARL GODWIN. 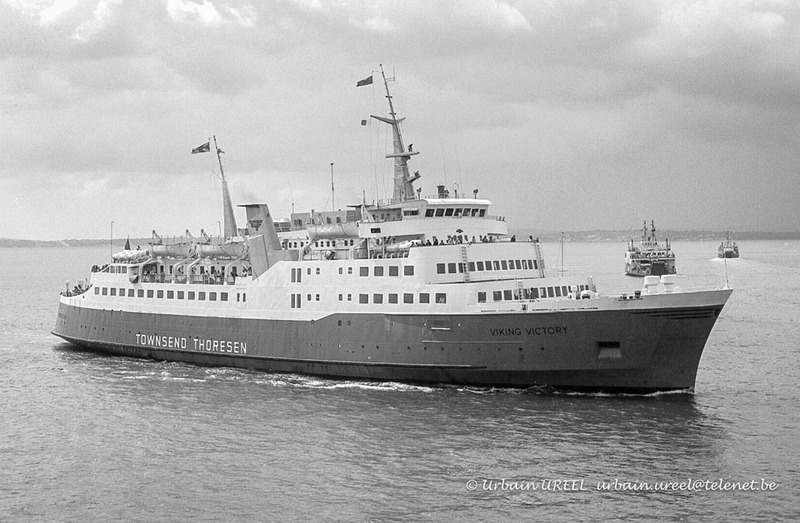 May 18th 1978 – September 10th 1978: Operated between Portsmouth – Cherbourg. October 31st 1978: Introduced between Felixstowe – Europort. 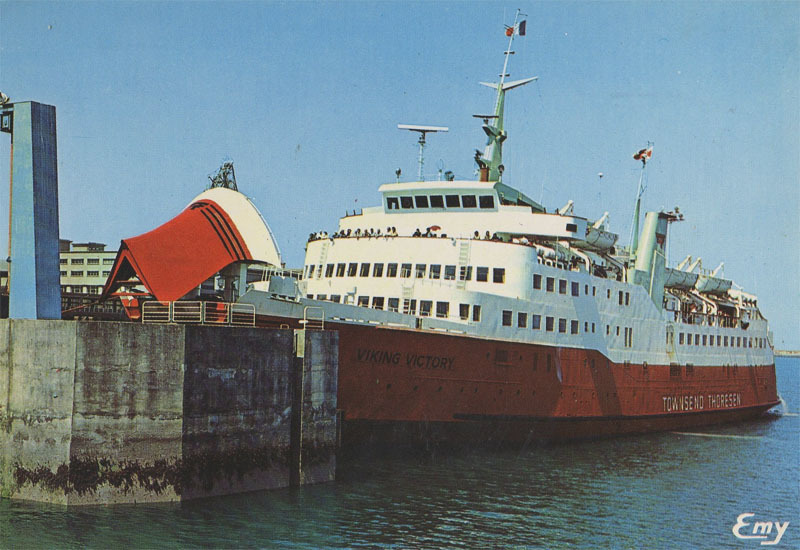 June 1979 – September 1979: Portsmouth – Cherbourg. Thereafter laid up for the winter. 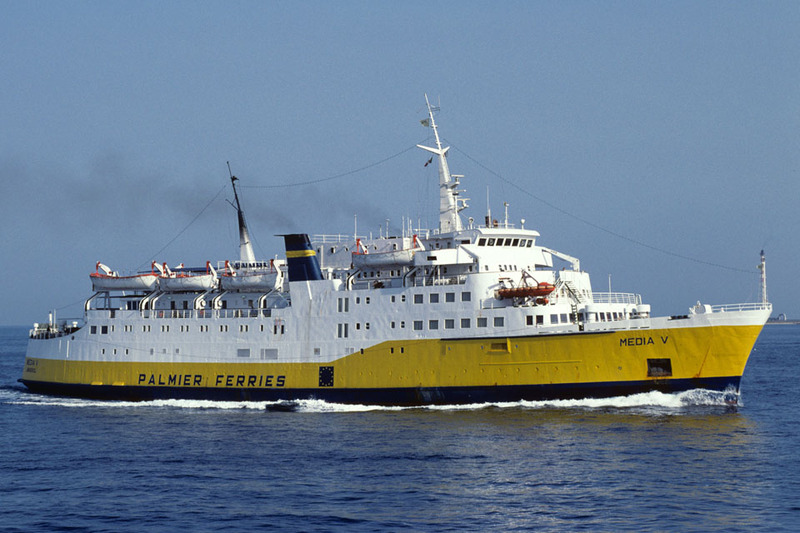 June 1980 – September 1980: Operated between Portsmouth – Cherbourg. April 9th 1981 – April 16th 1981: Chartered to Sealink Manx Line for Heysham – Douglas services. 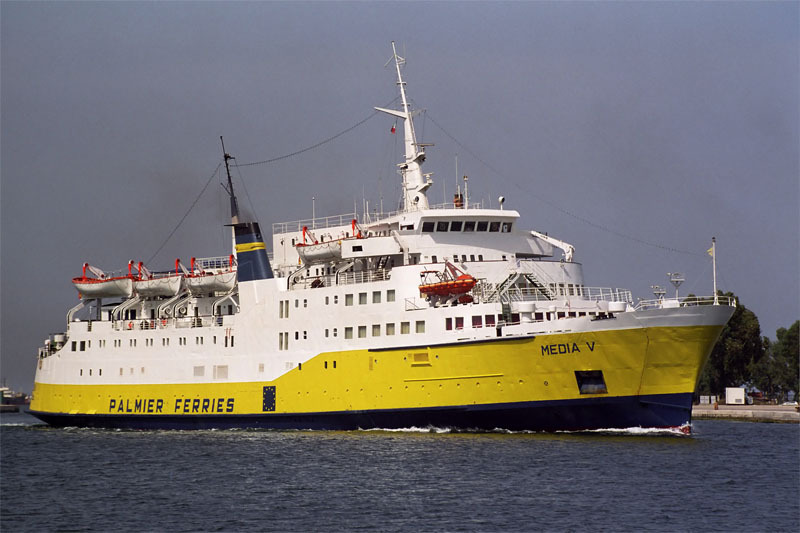 April 21st 1981 – September 13th 1981: Operated between Portsmouth – Cherbourg. September 13th 1981: Departed Portsmouth for Gothenburg to be laid up for sale. 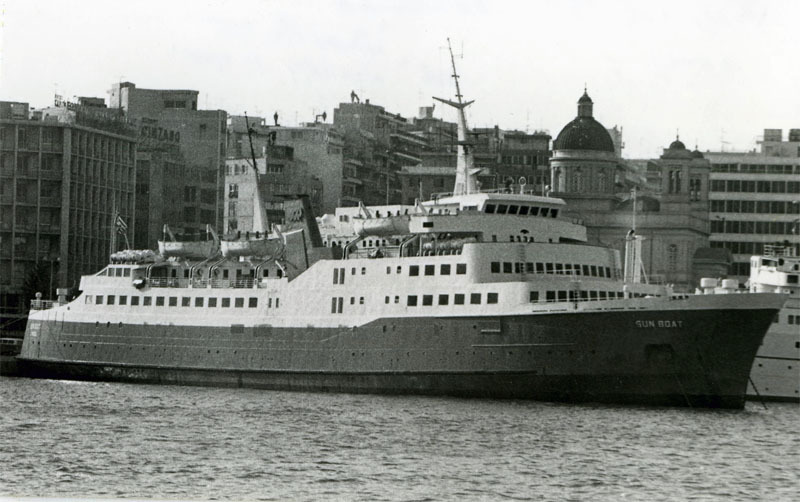 1983: Sold to Euphoria Navigation Sa, Limassol, Cyprus, renamed SUN BOAT. 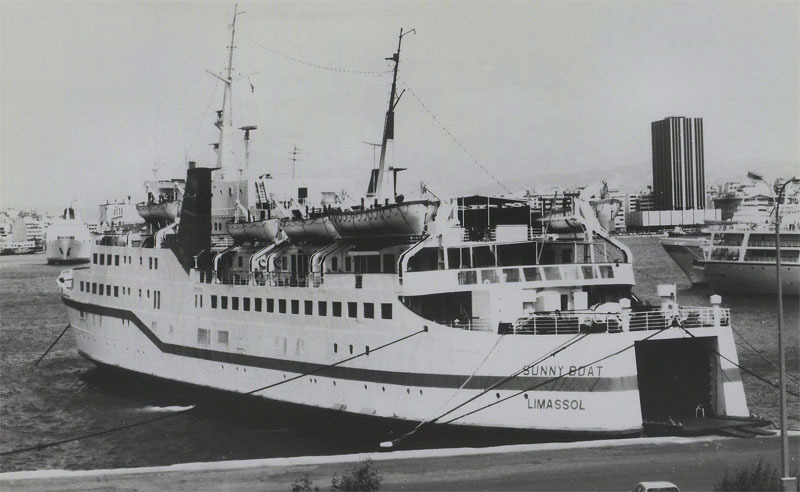 Introduced by Happiness Maritime Co between Piraeus – Rhodess – Limassol – Beirut – Latakia. February 7th 1985: A fire on the SEA NYMPH, which was moored alongside, spread causing minor damage. 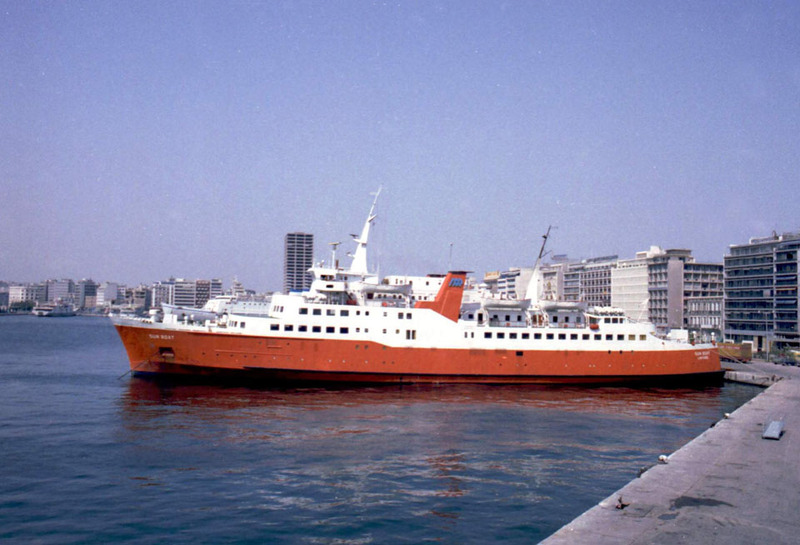 April 1985: Sold to Red Sea Line SA, Limassol, Cyprus, renamed CARAVAN. Introduced between Aqaba – Jeddah – Suez. 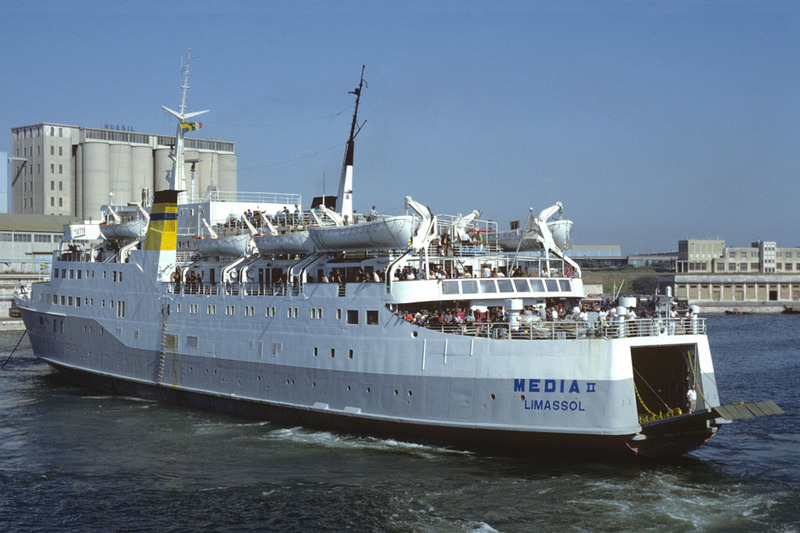 April 19th 1986: Sold to Bluebird Shipping Co Ltd, Limassol, Cyprus, renamed VASMED. 1986: Registered to Sharo Shipping Co. Ltd., Limassol, Cyprus. Renamed SUNNY BOAT. 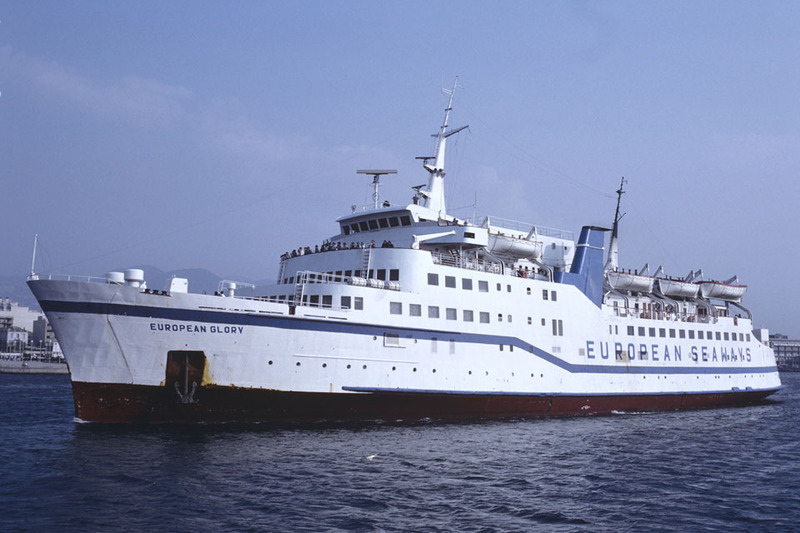 Operated between Piraeus – Rhodes – Heraklion – Limassol – Latakia. July 1990: Chartered to European Seaways. Renamed EUROPEAN GLORY. 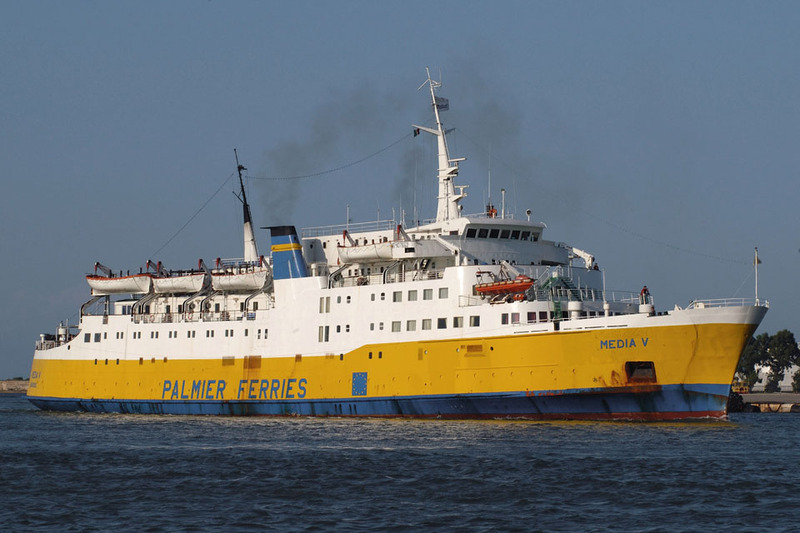 Operated between Patras – Igoumenitsa – Korfu – Brindisi. 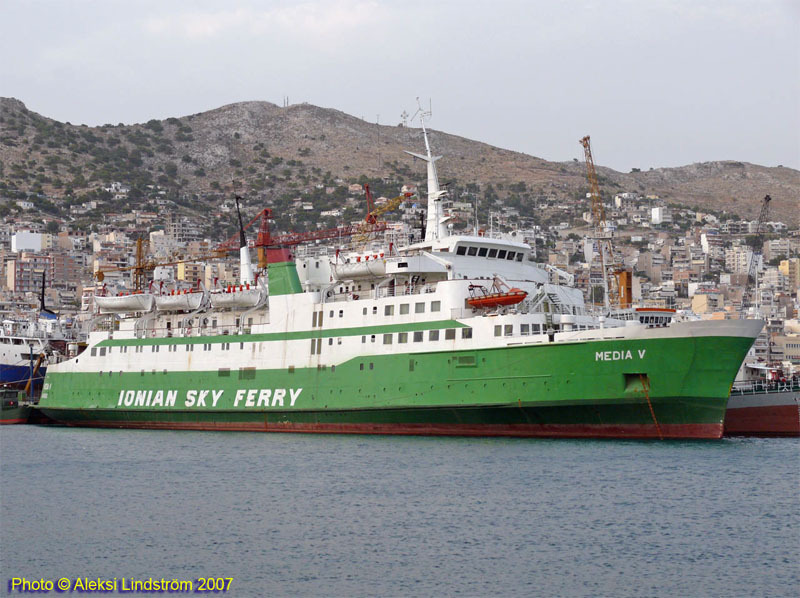 July 1991: Sold to Regonti Navigation Ltd, Piraeus, Greece. 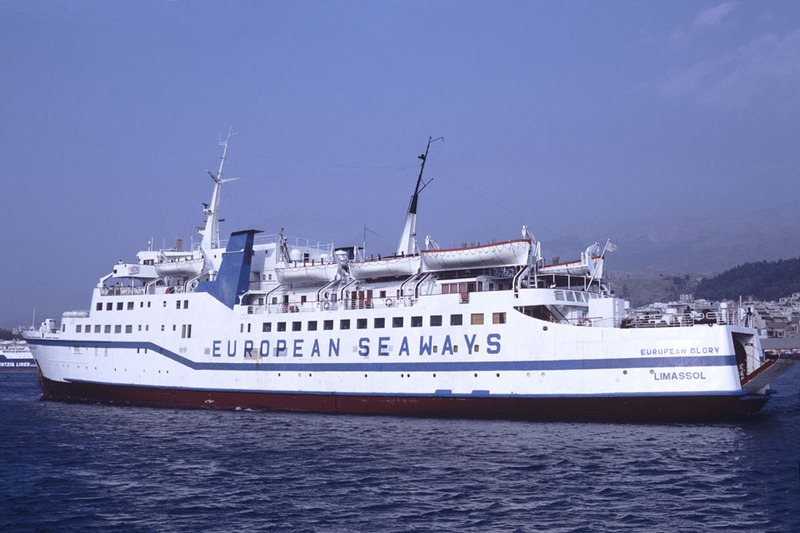 September 1991: Chartered to Hellenic Mediterranean Lines Piraeus, Greece. Renamed NEPTUNIA. Introduced between Patras – Igoumenitsa – Corfu – Brindisi. 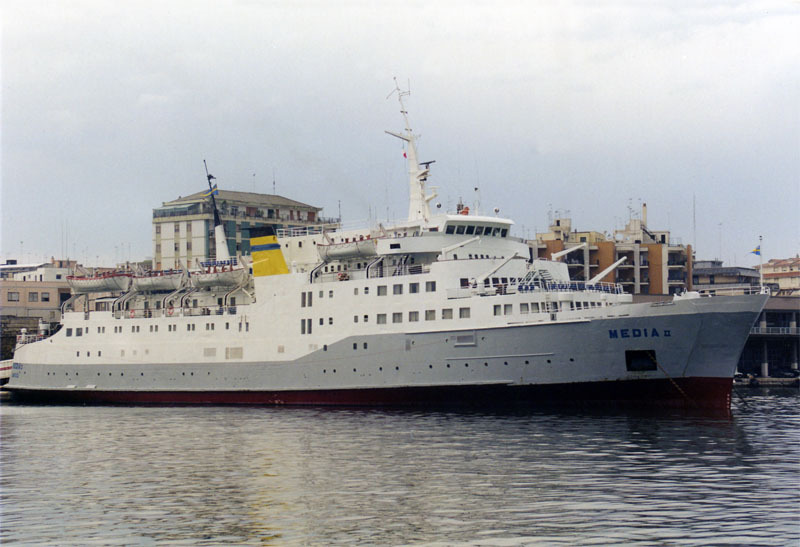 1992: Sold to Hellenic Mediterranean Lines, Piraeus, Greece (Registered in Cyprus with home port being Limassol). Renamed MEDIA II. Introduced between Patras – Igoumenitsa – Corfu – Brindisi. March 8th 2002: Sold to Mediterranean Freedom Marine, Limassol, Cyprus, renamed MEDIA V. Introduced between Italy – Albania. May 1st 2005: Arrested in Durres, Albania. September 9th 2006: Arrived Igoumenitsa. November 16th 2006: Arrived Drapetsona. 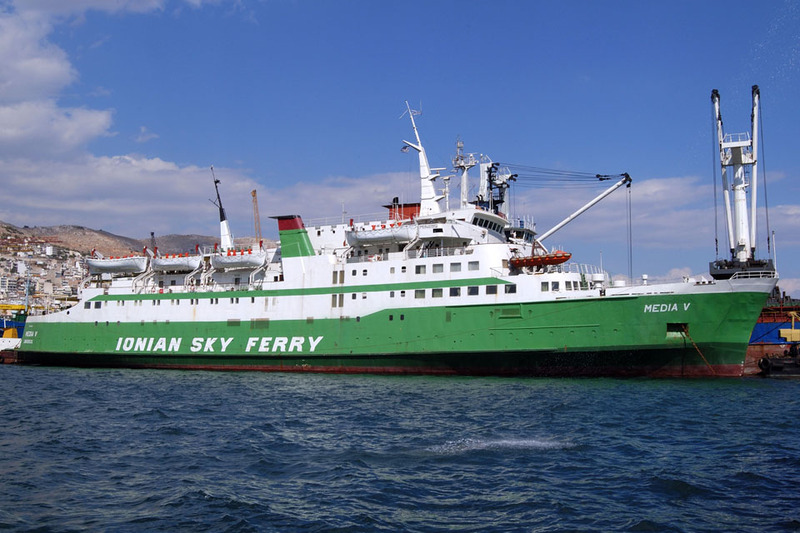 2007: Planned services for Ionian Sky Ferries between Brindisi – Corfu – Igoumenitsa did not materialise and she was laid up. 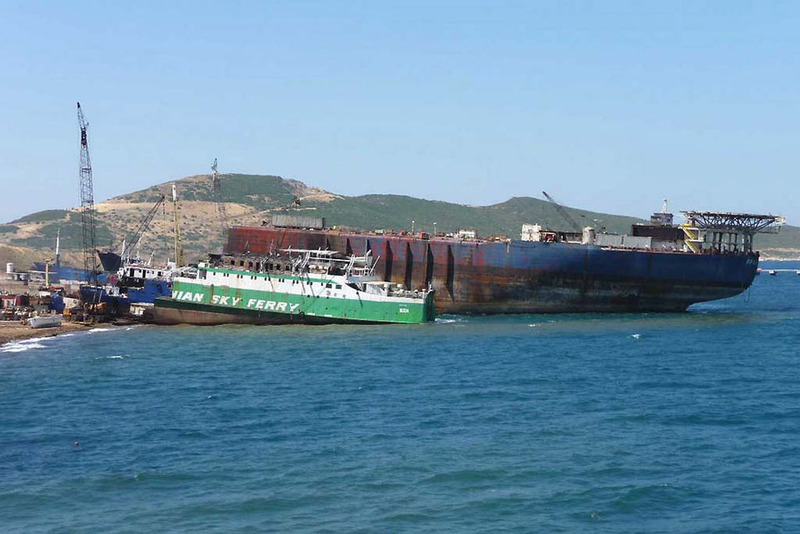 2007: During the autumn she was floated to Eleusis Bay to await scrapping. March 12th 2008: Sold by auction for breaking. May 4th 2008: Having been renamed EDI arrived in Aliaga, Turkey. May 14th 2008: Beached and scrapping commenced. All information is believed to be correct and no responsibility is accepted for any errors or omissions found. All items included in this article are subject to © copyright. We would like to take this opportunity of thanking: Tony Garner, Frank Heine, John Hendy, Ken Larwood, Aleksi Lindström, Selim San, Urbain Ureel and Andreas Wörteler for their assistance in compiling this feature.